Welcome to Wilde Subaru's Service Department. At Wilde Subaru, our highly qualified technicians are here to provide exceptional service in a timely manner. From oil changes to transmission replacements, we are dedicated to maintaining top-tier customer service, for both new and pre-owned cars. We have a full-service Subaru repair shop located in Waukesha, serving the greater Milwaukee area. Subaru builds some of the best mechanically designed, engineered, and manufactured vehicles in the world. Vehicle maintenance is an important factor for keeping your Subaru operating at peak performance. Wilde Subaru partners with Subaru owners in following a regular schedule for maintenance and performing minor checks between maintenance services. Through such a partnership, Wilde Subaru can help make your Subaru last longer and reduce lifetime maintenance costs. Our Milwaukee auto repair facility features the latest tools to diagnose, service and maintain your Subaru. Wilde Subaru offers valuable service coupons to our service customers. Save on oil changes, air filters, wiper blade replacements, tires, car wash and detailing, brake repair and more. 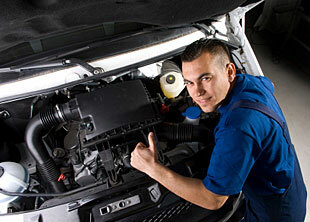 Click here to see our current Auto Repair Service Coupons. Need tires? Trust the tire experts at Wilde Subaru. Our experienced technicians will help you select the ideal tires for your vehicle, the way you drive and the roads you drive on. With access to over 10,000 different tire options, rest assured Wilde Subaru is your one-stop-shop for any and all of your tire needs. Click here to shop at our Subaru Tire Center. Take advantage of current special offers on tires which typically include rebates or gifts with purchase. Click here to view tire specials. Visit Wilde Subaru Dealership near New Berlin WI to service new and used Subaru models as well as Certified Pre-owned cars and trucks. Ask about our Internet specials. Wilde Subaru near Menomonee Falls WI provides a complete service department with factory trained technicians to repair all makes and models of Subaru vehicles. Wilde Subaru near Sussex WI also offers convenient service appointments. Proudly serving the nearby communities of Waukesha, Milwaukee, West Allis, Wauwatosa, New Berlin, Brookfield, Menomonee Falls, Muskego, Pewaukee, Sussex, Wisconsin.